The madmen at Pixar once again prove themselves the best storytellers on the planet. Or off it. UP is a unique animated adventure that follows crusty retiree Carl (voiced by Ed Asner) on his adventures in trying to float his house with thousands of balloons to his dream locale. Another humbling display of Pixar’s incredible grasp of story structure. How do Pixar do it? Look at their ratings record on imdb – every major theatrical release (except CARS) scores 8/10 or above. From TOY STORY to THE INCREDIBLES to WALL-E, it is becoming boring referring to them “batting another out of the park.” They know no other trajectory. The first section of the movie is a sad little vignette all on its own. We first meet Carl as a cute little boy, marveling at the exploits of adventurer Charles Muntz (voice of Christopher Plummer). Also a fan of Muntz, Carl’s future wife, Ellie (Elie Docter), whom he Meets Cute in a dilapidated house, as she pretends to fly it to an enigmatic South American rainforest plateau called Paradise Falls. A whirlwind montage of Ellie’s and Carl’s lives as they marry, move into that house and try to keep ends met while still vowing to trek to Paradise Falls “someday.” He’s a balloon salesman at the zoo, while she works in the South American exhibit. Montage rushes through their married life, dark days of miscarriage, old age, and finally Ellie’s death, throughout, a picture of their promised destination on the mantel seeming to recede further into childhood fantasy. It stirs simultaneous nostalgia, bereavement and regret. And it’s just a cartoon! As city developers tear down everything around Carl’s little house, he resolves to make his fantasy a reality. He attaches thousands of air balloons to his house, rends it from its moorings and takes to the skies, with ingenious steering and sailing mechanisms that were once merely play-acting ropes for young Ellie. Along for the ride is a plump little Asian-American boy scout, Russell (Jordan Nagai), who was on Carl’s porch when he lifted off. It is refreshing that Pixar would create this mixed-ethnicity character, as it has always been the provenance of spoiled blond white kids (which Carl was in the opening scenes) to go on adventures such as these. In the sky, no one cares if you leave your blinker on. En route to the Falls, Carl and Russell encounter a big exotic bird which Russell names Kevin (and continues to call it that even after it is discovered the bird is a mother), a dog named Dug with a special collar that enables him to speak (voice of co-writer-director Bob Peterson) and Muntz himself as a neurotic recluse with his pack of trained collar-speaking hounds. 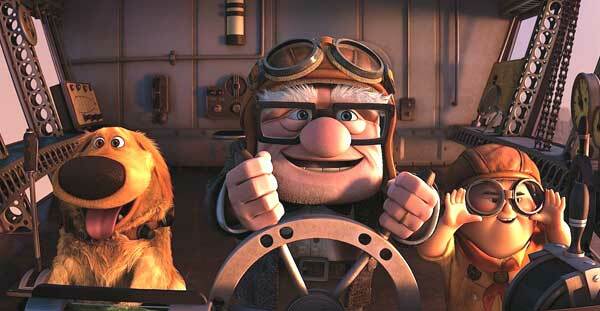 Using the word ingenious to describe Pixar is like using skank to describe Britney Spears – it’s intrinsic; built into every detail of this production, from the logistics of Carl’s balloon-powered house to Muntz’s airship, to the house-airship chase through canyons, and the endearing little animation details. Characterizations are, once again, as good as you will find in any drama. Though the movie obviously has a strong kiddie demographic, Russell’s pathological need to earn his badges to impress his absent father is far from the usual syrupy guff. And watch how artfully Dug’s lovable character is carved out in a few seconds of screentime, through his actions, voice and content of his disjointed dialog–squirrel! This is why Pixar shames Disney when it comes to writing “real” characters – Disney’s are STILL written as naively as Amy Adams plays Giselle in ENCHANTED (2007). Pixar writing vets Pete Docter (TOY STORY, MONSTERS, INC) and Bob Peterson (FINDING NEMO) direct, with Thomas McCarthy sharing co-writing credits with them. Creating an action-adventure without overpowering the people at the heart of it. 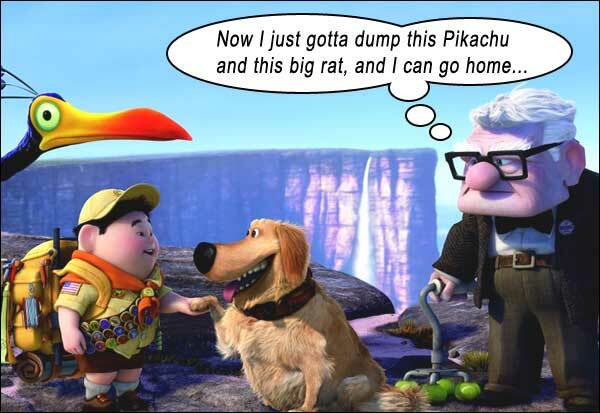 UP was recommended to me by a screenwriter as an example of the perfect execution of the screenplay form. It is. A whip-cracking put-us-in-our-place illustration of just how a story should be told, with humor, action, poignancy, and every little detail paid off–squirrel! Directors: Pete Docter, Bob Peterson. Writers: Pete Docter, Bob Peterson, Thomas McCarthy. Starring: Edward Asner, Christopher Plummer, Jordan Nagai, Bob Peterson, Delroy Lindo, Jerome Ranft, John Ratzenberger, David Kaye, Elie Docter, Jeremy Leary.